Delilah Dirk is hands down my favorite graphic novel series. I’m always a little surprised when it returns because it just seems like a publisher would throw a mountain of cash at Tony Cliff and pull him away from this story. Thankfully, either that hasn’t happened, or more than likely Mr. Cliff would rather be working on Delilah Dirk. I will never forget the first volume of Delilah Dirk. It was incredibly powerful in its writing, but more so in its visual storytelling. Cliff makes the writing and artwork so seamlessly that it’s easy to appreciate both. The second volume had a different tone and a different journey. It was personal, but different for our main characters. It too resonated with beauty that I struggle to find anywhere else in the world of comics. Don’t get me wrong; there are so many talented illustrators out there with varying styles and amazing talents. It’s just that seeing a setting that Cliff has illustrated is like falling in love for the first time. It moves you, hell, it makes you want to move. After reading a volume of Delilah Dirk, I’m filled with the need for adventure. To make a flying ship and set out upon the world. Cliff’s artwork calls to you in a way that no other artist I’ve found does. To say he’s masterful seems like only the beginning. He’s a once in a generation talent. 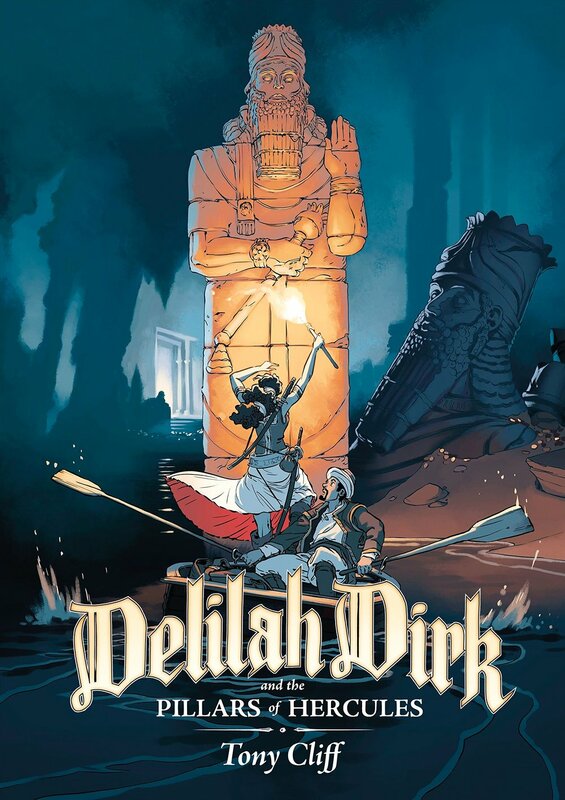 The third installment of Delilah Dirk is different from the previous two. That is the amazing strength of Cliff as a storyteller in that he doesn’t rely on the same story beats over and over. Each of the three volumes feels very different thematically. Delilah and Selim are trying to help a ship seeking safe harbor, but the tyrant that controls the entrance to the docks is ready to sink them if they should even reach their firing range. There is a deadly storm out making it dangerous for the ship with each passing minute. Some excitement ensues, and they accomplish their goal in typical Delilah and Selim fashion. They get captured though but are helped by a Dutchman by the name of Laurens Van Hassel. He tips them off to a tomb that’s been discovered that the mad tyrant is looking for and soon they’re off to beat him to it and fill their pouches with treasure. While there, Selim begins transcribing the story written along the tomb, which catches Van Hassel’s attention. Soon enough all three of them are on an adventure together looking for the third pillar of Hercules. The story is wonderful. The new character adds plenty of drama in that he’s also a writer and begins writing about their adventure. This proves interesting when an old enemy of Delilah’s finds her due to the stories, but soon after she likes the attention and flattery. Selim has a problem with the embellishments that they’re taking with the story and would rather something resembling the truth be told. This causes some friction between them. Then there’s Van Hassel, who’s never trustworthy. Selim is constantly leary of him and at first so is Delilah. There’s a great scene in which they don’t speak out loud, but their faces say everything. Cliff still gives caption boxes to them to express what it is they’re communicating, but it’s damn near perfect without the boxes. It shows how well these two know each other, that they can hold a conversation without saying a world. What continues to be very strong with this story is the friendship between Delilah and Selim. It’s not romantic in the least, but instead the ultimate friendship. They have each other’s backs no matter what. They worry about it other like family which is refreshing and prevents unnecessary distractions to the story. Romance would ruin the chemistry of this book, but ever since the first volume Cliff has managed to build their friendship, making it stronger and stronger. They understand each other’s quirks and don’t necessarily like every aspect of the other's personality, but that’s what makes them come across as true friends. I probably don’t need to gush about the artwork anymore on this review, but I will do so because it’s my damn review. It’s not just the linework or the masterful way that Cliff plans a page. Something that you can see at the end of the volume by the way. It’s the coloring. The coloring is what brings this world to life. It makes it feel animated and alive. Cliff, if he has any free time, should teach a class on coloring so that his beautiful technic can spread across all of comics and graphic novels. It doesn’t have to be the only style, but with his technique as the groundwork, I can only imagine how much better and more exciting comics would be. I will read this volume again, and likely again. I love the story so much, but I can’t get enough of the artwork. Its why I always get excited when I see a new volume of Delilah Dirk. I can’t think of a better series of graphic novels. First Second publishes a lot of books and has published a lot of book series, but nothing tops Delilah Dirk. Each volume on its own is masterful and a complete story. You don’t need to have read the first two; you’re just rewarded by having done so in the first place. That’s the mark of a great series of books when on their own, they’re great, but when they’re put together, they reach a new level. I can’t think of a better book to go out on for Comic Bastards. Maybe when the fourth volume releases I’ll come back and review it, but for now and for a long while, this is my last review. 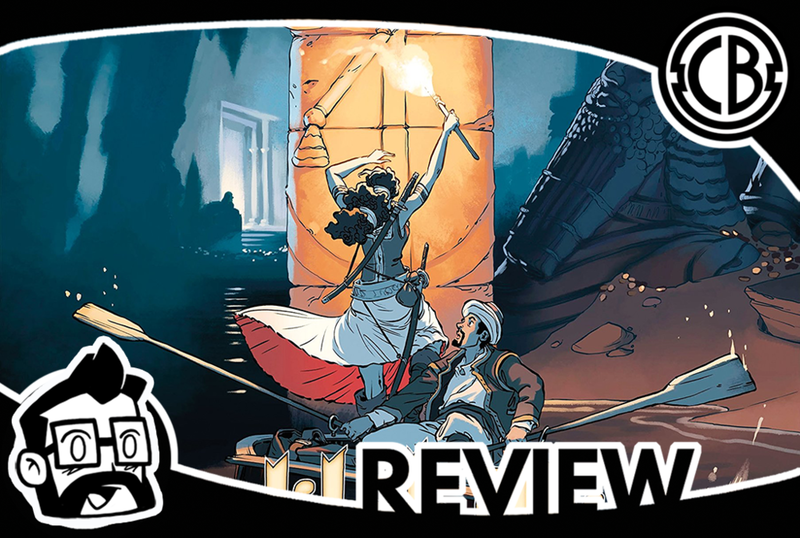 Thank you for reading this review, and it is my great hope that you’ll pick up Delilah Dirk and the Pillars of Hercules and if you haven’t already, the previous two volumes as well. I’ve written a lot of reviews, I’ve read a lot of comics and don’t have a clue as to my top ten or five, but I can tell you with confidence that Delilah Dirk would hold three spots on either of those lists. Thank you, readers, and thank you, Tony Cliff, please keep Delilah and Selim’s adventures going as long as you have a story to tell.